Blackberry confirms UK launch date for PlayBook tablet | What Hi-Fi? BlackBerry has confirmed the UK release date for its PlayBook tablet as June 16th. The 7in tablet will be available from £330, for the 16GB version, £400, 32GB, and £465 for the 64GB model. 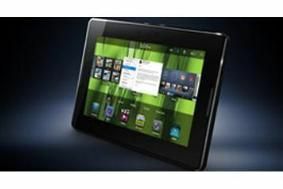 The tablet features a 1024x600 resolution, dual full HD cameras, 1GB of RAM and a capacative touchscreen. Research in Motion, the company that gave the world the Blackberry, has launched the Playbook, a tablet device aimed – like the company's mobiles – at the business world. RIM dominates the smartphone market in the US and hopes the new 7in-screen-sporting tablet will prove similarly successful with its existing customers. The Playbook has a multi-touch screen, front and back-mounted cameras that support video calling and full HD video capture, an HDMI video output and Bluetooth and WiFi support (though there will be 3G in the future). It runs a tablet-specific OS, includes a 1GHz dual-core chip and 1GB of RAM. Measuring just 10mm thin and weighing only 400g, it certainly sounds good on paper. The device is set to launch in 2011 but will be released to corporate customers and developers next month.